The Grolier club of New York was founded in 1884 to celebrate the graphic arts involved in making high quality books; page design, typography, illustration and book binding. The club is named after the renowned book collector Jean Grolier (1490-1565) the Treasurer General of France. Grolier was a patron of the Venetian printer Aldus Manutius and he had ornate bindings made for the volumes he bought. Both the British Library and the National Library in Paris have volumes from his collection. The current home of the Grolier club is in an affluent part of Manhattan. They have a museum and large research library and host talks and seminars. They also occasionally publish limited editions of exquisitely designed, illustrated and printed books. New York by Rudolph Ruzicka and Walter Eaton was published by the Grolier club in 1915. It captured a city in transition. Skyscrapers were transforming the city's skyline as it became one of the most populous and economically powerful city's in history. The book was beautifully designed and illustrated by the type designer and wood engraver Rudolph Ruzicka (1883-1978). The colour wood engravings by Ruzicka were printed in Paris by Emile Fequet. Rudolph Ruzicka was born in Kourim, Bohemia in 1883. He moved with his parents to Chicago in 1894 and by 1897 he had became an unpaid apprentice in a wood engraving workshop. He studied at the Chicago Art Institute and New York School of Art. Ruzicka became well known as a type designer and worked for the Mergenthaler Linotype company. He designed the typeface Fairfield in 1940 and re-designed the Harvard Business Review in the early 1950's. In 2002 Grolier published New York Revisited - a follow-on volume to the 1915 volume (in the world of fine art printing things can sometimes take time). The text in the book was written by a Grolier club member Kenneth Auchincloss and the book was designed, typeset, illustrated with colour wood engravings and hand printed by the fine-art printer Gaylord Schanilec. The highlight of the book is the wood engravings by Rudoph Ruzicka. Their muted colors and delicate line partially disguise the artist's reaction to the city, which one suspects was primarily alarm... His images are deceptively light, but what they convey is the enormous vertical weight of the city. A total of 250 copies of New York Revisited were printed. The first 50 were specially bound and each contained a portfolio of Ruzicka engravings that had been newly printed by Schanilec from the blocks that Ruzicka had cut in 1915 (the original blocks had been found in an old box by the Grolier club librarian). 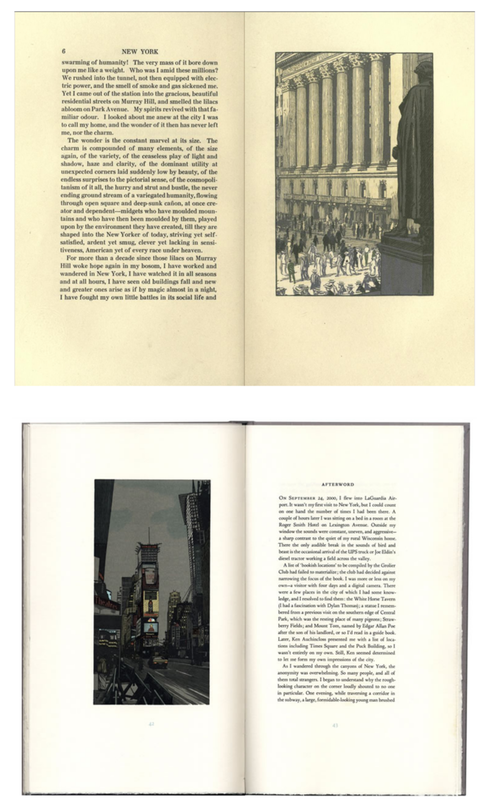 Typical two-page spreads from (top) New York (1915) and (bottom) New York Revisited (2002) both published by the Grolier Club of New York.